All transactions are safe and secure with a reliable history in online purchasing behind each of our associates. Buy the Jack Bauer Takes Aim 24 t-shirt to own 24 clothing and merchandise. Jack Bauer takes aim next to the 24 logo on the front of this black T that is an attractive way to show you're a fan of the FOX 24 tv show. Perhaps he's planning to shoot someone's kneecaps out before choking them with a cordless phone. The color of the silhouette and logo on the front of the tee can be changed, in addition to the black apparel color. This 24 tv show t-shirt is a good buy for any fan of the heart pounding television series starring Kiefer Sutherland as CTU Agent Jack Bauer. 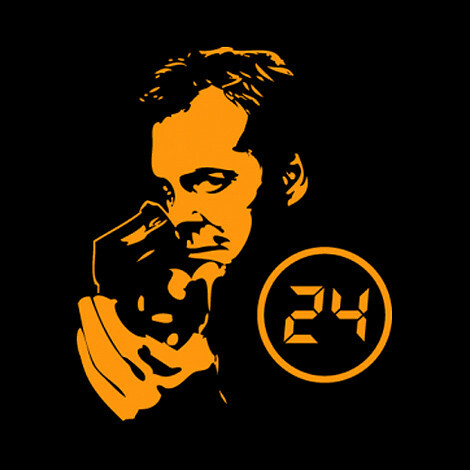 In addition to the Jack Bauer Takes Aim 24 tee above, browse the 24 Clothing Gallery for more apparel like men's and women's clothes, kids shirts or hoodies.